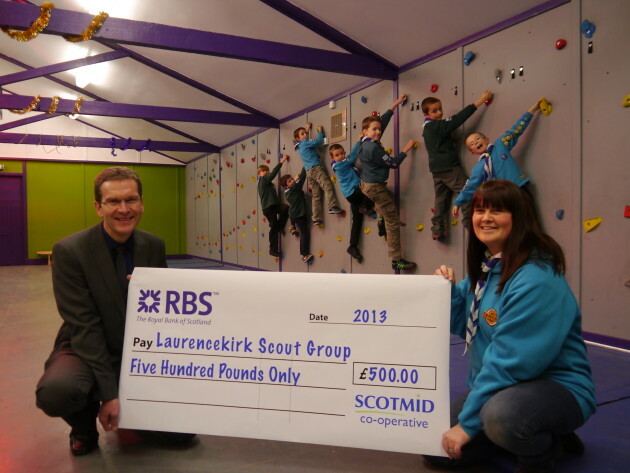 Laurencekirk Scout Group, the charity which manages the town’s Beaver, Cub and Scouts, has become a recipient of a Scotmid community grant. The grant of £500, awarded by Scotmid’s North Regional Committee, has been used to install a climbing wall as part of the of the Group’s Scout Hut refurbishment. The refurbishment of the hut means that it will be deemed fit for purpose for a further twenty five years, having been in use by Laurencekirk Scouts since 1954. The next stage will see the redevelopment of the kitchen and toilet facilities.